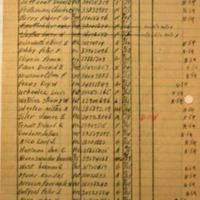 A page from a record book listing battle casualties from the U.S. Army's 157th Infantry Regiment. The casualties listed died in France during World War II. 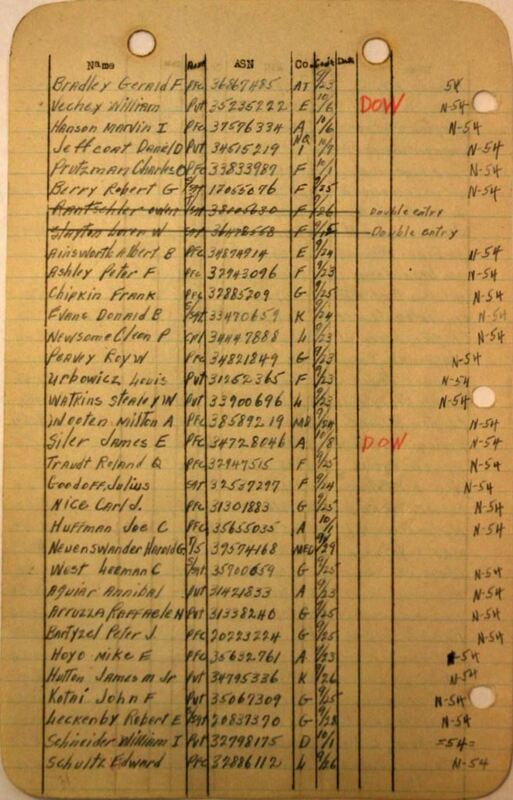 A notable casualty listed in this record is Private James M. Hutton, Jr. (ca. 1914-1944). Pvt. Hutton was a private in the U.S. Army during World War II. He was born to James Hutton sometime around 1914. Pvt. Hutton grew up in Jersey and moved to Miami, Florida, sometime before 1940. He married Florence E. Offnick and had a son, James Hutton III. Pvt. Hutton was drafted into the Army on October 30, 1943, and was placed in the 157th Infantry Regiment's 45th Infantry Division. He died during combat in France on September 26, 1944, and is currently buried at the Epinal American Cemetery and Memorial in Dinozé, France. Pvt. Hutton was awarded the Purple Heart for his service. Digital reproduction of original record book: 45th Infantry Division Museum, Oklahoma City, Oklahoma. Original record book: 45th Infantry Division Museum, Oklahoma City, Oklahoma. 45th Infantry Division Museum, Oklahoma City, Oklahoma. Copyright to this resource is held by 45th Infantry Division Museum and is provided here by RICHES of Central Florida for educational purposes only. "Pvt James M Hutton, Jr." Find A Grave. http://findagrave.com/cgi-bin/fg.cgi?page=gr&GSln=Hutton&GSiman=1&GScid=1991677&GRid=56373182&. "Electronic Army Serial Number Merged File, ca. 1938 - 1946 (Enlistment Records)." National Archives & Records Administration. https://aad.archives.gov/aad/record-detail.jsp?dt=893&mtch=1&cat=WR26&tf=F&q=34795336&bc=sl&rpp=10&pg=1&rid=5175258. "James M. Hutton Jr.." American Battle Monuments Commission. http://abmc.gov/node/380228#.VrTYE7IrLIU. "Florence Hutton | 1919 - 2013 | Obituary." Henderson-Biedekapp Funeral Chapel. https://www.meaningfulfunerals.net/home/index.cfm/obituaries/view/fh_id/14583/id/2227636. “157th Infantry Regiment Battle Casualties, Part 2.” RICHES of Central Florida accessed April 24, 2019, https://richesmi.cah.ucf.edu/omeka/items/show/7003.